This is my first attempt at building a box. I have a limited budget so my choice of wood was whatever I could get cheap. That ended up to being white ash at HD. I learned a lot from this project. One is having a work shop to work in would be nice. Mine consists of a patio table on my porch. This was ok provided it wasn’t raining. I also learned that having a nice table saw really matters, mine is ten years old and I bought it new for 100 dollars. The fence moved a lot, so I had to measure and clamp every cut. I also learned that sanding is your friend, learn to love it. It was a lot of fun to build and do the other details like carving the deer head and doing the inlay. I should note that I bought the inlay from Constantine’s in Ft. Lauderdale Fl. It came in a circle form but I did not like that, so I cut out what I liked and inlayed it. It was my first attempt at doing inlays. I actually watched someone do it on YOUTUBE and tried it on a piece of scrap frist. 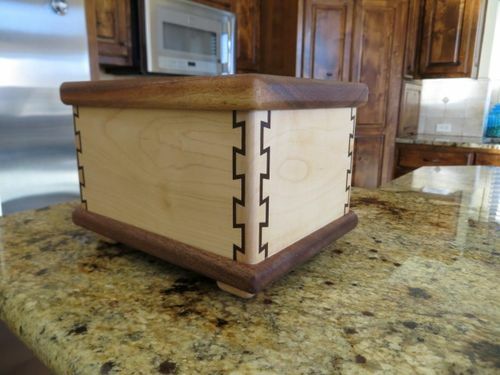 The next box I do I will create my own inlay. I would also like to try and hand cut the dovetails instead of using a jig. The white ash seemed to contrast well with the carving, so I choose to finish the box with a clear acrylic lacquer. Added a half mortice lock to the box see last picture. Ended up going with a piano hinge for stregnth. Routered out a notch for the hinge to sit in top and bottom. Thanks for all the comments. Very nicely done—great job for a first project! Good job. You look like you will be good at this. Very, very nice job, especially for what you have for tools! Here’s a picture of a double dovetail. I don’t know where the blog is that you mentioned you’re looking for. Is this the kind of dovetail you were looking for? This was made on an Incra fence system. Nice box for your firearms. Well done. Your excellent work and beautiful result certainly belies your tool limitations and proves that fancy tools don’t make a craftsman. Nice! Love the fancy dovetails. Keep the guns in a locker or safe so you can enjoy them for years. So many technics and details in one box,outstanding!